The Egyptian fiscal year runs from July to June. The national currency is the Egyptian pound (LE, gineih in Egyptian dialect, from British English guinea), which equals a hundred piasters (qirsh, or irsh in Egyptian Arabic). Egypt has the largest population in the Middle East and North Africa, but its economy ranks just fifth, after Saudi Arabia, the United Arab Emirates, Israel, and Algeria. Excluding oil and gas, however, Egypt does have the second largest economy in the region, after Israel. In terms of per capita GDP, Egypt ranks even lower, among the bottom five of the eighteen countries, just ahead of Iraq, Syria, Sudan, and Yemen. Egypt’s largest trading partner is the European Union: some 35 percent of Egypt’s total foreign trade is with the EU. Within the EU, Italy is Egypt’s main export destination. 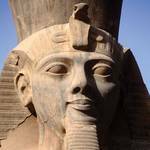 The United States is Egypt’s second largest trading partner, representing some 17 percent of Egypt’s total foreign trade. The single biggest donor of Egypt is the US government, which has provided more than USD 25 billion in economic assistance since 1975. In 2004, the US budget allocated USD 575 million for economic aid. This amount was reduced gradually, to less than USD 400 million in 2009. The European Union as a whole (Community, Member States, and European Investment Bank) is the second largest donor to Egypt. The informal sector plays an important role in the Egyptian economy and serves as a refuge for both men and women. Informal activities are on a small scale, but, because of the large number of informal enterprises, it is estimated that over five million people take jobs without contracts or social security. The Egyptian gross domestic product (GDP) in 2015 had reached 330.7 billion US dollars, in comparison with 301.5 billion dollars in the year 2014, and 286.01 billion dollars in 2013. The GDP per capita in the year 2015 had reached 3614 US dollars, in comparison with 3365 and 3264 US dollars in the years 2014 and 2013, respectively. The rate of inflation in 2015 had reached 10.9%, in comparison with 11.5% and 9% in the years 2014 and 2013 respectively. According to the World Bank, 28% of the population is below poverty line in the year 2015, noting that this percentage increases in upper Egypt to 60%. Despite the improvement of the total growth rates between the year 2014 and 2016 as it has reached 4%, but the ُEgyptian macro-economy is suffering from numerous dysfunctions at the level of the instability of exchange rate, and the decrease of international currency reserves, in addition to difficulties which the investment climate is facing in Egypt. 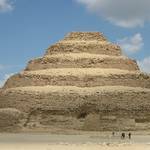 Before the country became independent, the Egyptian economy depended largely on agricultural activities. Raw cotton, exported to Europe, formed the largest source of income. After the 1952 revolution, President Nasser turned Egypt into a state-led economy accompanied by the nationalization of industries and the redistribution of agricultural lands, which benefited small farmers. Nasser also led the drive towards industrialization, establishing large steel mills, chemical plants, and textile factories. 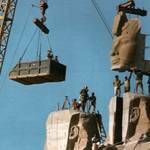 But Nasser’s policies did not turn Egypt into a flourishing economy. Debt generated by huge public spending and the 1967 war with Israel left the country impoverished. Inheriting a bankrupt economy, President Sadat introduced a free-market approach and sought foreign investment. Despite measures to liberalize the market, he did not undo the nationalization of industries, and his so-called Infitah (‘Opening’) was marked by corruption and benefited only a small elite of government officials and businessmen. Economic growth did not translate into benefits for the poor, leading to resentment among the lower classes. After the 1970s a growing number of Egyptians found an individual solution for their economic problems and those of their families by seeking work in the rich oil-producing Gulf States. Under President Mubarak the country continued to follow the path set out by Sadat. In the 1990s, Egypt experienced an economic downturn leading to the devaluation of the Egyptian pound. That was probably among the key factors that convinced Mubarak to take part in the US-led war to liberate Kuwait from Iraqi occupation in early 1991. As a reward, the United States and other major European countries cancelled half of Egypt’s debt of nearly USD 40 billion, allowing Mubarak to revive the Egyptian economy. In the new millennium, the government initiated more reforms towards market liberalization and took measures to put the public finances in order. In 2003, the government floated the Egyptian pound for the first time and was no longer involved in regulating its price against foreign currencies. But, like many governments in the region, the government would interfere by injecting dollars into the market whenever the pound faced serious challenges caused by deteriorating economic conditions. This has been the case since Mubarak’s removal, which resulted in a serious downturn of Egypt’s economy. Tourism income dropped sharply, as did foreign investments, which decreased almost to zero, compared to USD 8 billion in 2010, according to a statement made by Finance Minister Hazem al-Beblawi in mid-October 2011. While Mubarak’s government prided itself on achieving unprecedented growth rates, up to 7 percent annually, it was obvious that the growth rates achieved under Mubarak did not mean much to the millions of Egyptians who came out to protest his lengthy rule and the control his son and president-to-be, Gamal, exerted over economic policies. They felt that they did not benefit from the economic surge under Mubarak, with widespread unemployment and income levels that kept them poor. The Suez Canal, tourism, and remittances by millions of Egyptians living abroad have been and will remain the largest earners of foreign exchange, but, as the international economic crisis of 2009 illustrates, the Suez Canal and tourism are also very sensitive to trends outside Egypt. Both sectors felt the pain of the global downturn as early as the last months of 2008. Although oil reserves and exports are expected to decline further, the extraction and export of natural gas is considered promising. Increasing domestic gas consumption will consume most of the newly produced gas against subsidized prices, but a considerable amount will be left for export. The petrochemical industry is also expected to be a significant source of income. Macro economic growth averaged about 4.5 percent between 2001 and 2006. Since then, the growth rate has reached as high as 7.2 percent in 2008, but this is still far below the 9 percent required to begin tackling the large problem of unemployment in the country. More than a half-million job seekers enter the labour market every year. As a result of the international economic crisis and the current political instability following Mubarak’s removal, expectations for 2012 are much worse. Trade has increased significantly over the past decade. Export of goods as percentage of GDP increased from 8.2 percent in fiscal year 2002 to 17.2 percent in 2006. 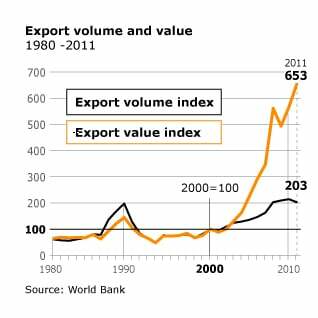 Imports have shown the same trend, increasing from 16.6 percent of GDP in 2002 to 28.3 percent in 2006. The trade balance has traditionally shown a structural deficit. The composition of exports has changed dramatically. Agricultural commodities, notably cotton, represented more than 70 percent of total exports in 1965, but they now account for less than 10 percent. 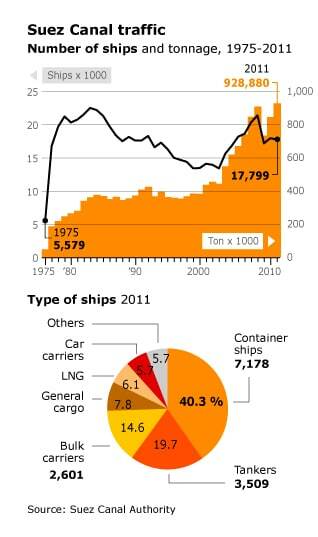 The majority of exports now are hydrocarbons, minerals, metals, and manufactured goods. Imports include pharmaceuticals, agricultural commodities such as wheat and maize, and manufactured goods such as cars and spare parts. Savings and investment rates remain low: 17.7 percent and 18.7 percent of GDP in 2006, respectively. Foreign investment has nevertheless been increasing steadily, rising to USD 8 billion in 2010. Investments stood at USD 6.1 billion (5.8 percent of GDP) in 2006, up from USD 3.9 billion (4.3 percent of GDP) in 2005. Most foreign investment has concentrated on the petroleum sector, but Egypt has, until recently, seen growing interest in other sectors, such as cement production, real estate, tourism, telecommunications, and banking. The increase in foreign investment was partly the result of deregulation and the privatization programme of Mubarak’s government, which met stiff opposition from the public, due to vested interests and the fear of job losses. According to the World Bank 2008 ‘Doing Business’ ranking, Egypt was among the top twelve reformers. Nevertheless, Egypt still ranked low for overall attractiveness for investors – 126 out of 178 countries – reflecting constraints such as contract enforcement, dispute settlement, and a rigid employment sector. After the revolution of 25 January, foreign investment hit an all-time low. In order to remedy this, President Morsi travelled to Qatar and obtained the promise of an investment of USD 10 million to be made in the near future. On a trip to China, Morsi, accompanied by a number of Egyptian businessmen, met and signed contracts with Chinese investors, with an approximate value of USD 3.4 billion. 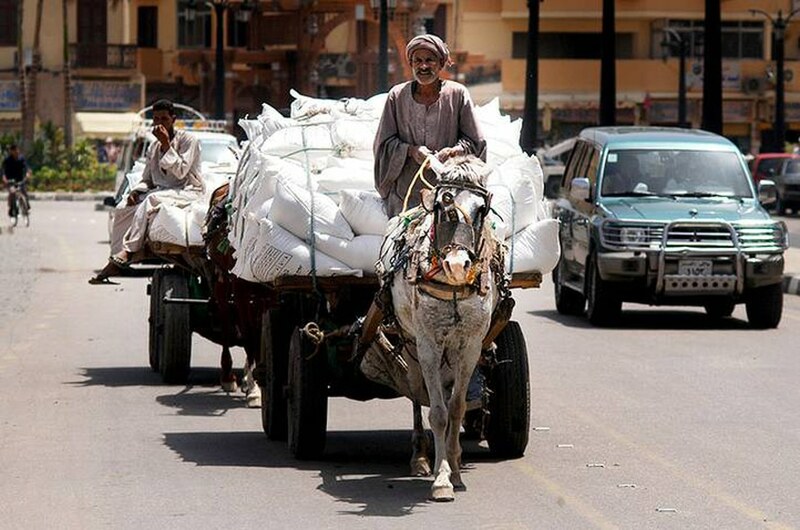 With global food prices rising, inflation has become a major concern for Egypt’s many poor. The inflation rate rose to an average of 11.7 percent in 2008, up from 4.2 percent in 2006, but the increase in the price of basic foodstuffs was probably as high as 25 percent. Food consumes most of the purchasing power of the poor, up to nearly 50 percent, according to government figures. Meanwhile, prices of construction materials, particularly cement and steel, also skyrocketed. 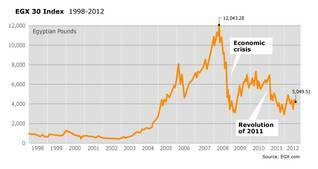 Due to the international economic crisis, inflation eased significantly in the first months of 2009. 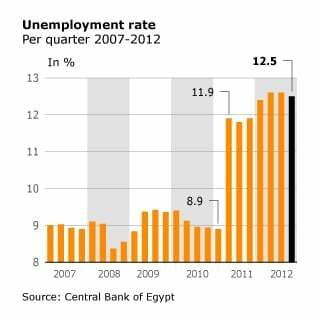 Since Mubarak’s fall in 2011, however, inflation has soared. Simultaneously, strikes have increased, and, although some demands have been met, pay rises have been insufficient to deal with inflation. Government revenues have increased steadily, with increasing tax receipts. Personal and corporate income-tax rates and property-tax rates have been reduced since 2005, but the government has simultaneously broadened the tax base, raising the number of taxpayers. From 2002 to 2008, tax revenues increased by almost 2.5 times, representing 65 percent of total revenues. Total government expenditure doubled from 2002 to 2008. Subsidies and social benefits more than tripled, making up more than a quarter of government expenditures. The overall budget deficit is still high but has been declining steadily, from 10.2 percent in 2002 to less than 7 percent in 2007. Gross government debt rose to 12 percent of GDP. Most of this is financed with domestic loans. Domestic public debt grew from 54 percent of GDP in 2001 to 65 percent in 2007, raising sustainability concerns. Approximately 95 percent of total external debt is public sector debt, mostly medium and long term. Since the revolution of 25 January, talks have been reopened with the International Monetary Fund for USD 3.2 billion to reduce the Egyptian budget deficit. The public sector has accounted for roughly a third of the GDP since the 1990s and currently provides work for 29 percent of the total workforce. State wages and pensions have not kept up with yearly inflation, so many civil servants have not had an increase in purchasing power for more than twenty years. Reforms are politically sensitive and are often not pushed through because of high social costs and expected angry public reaction to job losses. Since 2000, there has been a notable shift of employment away from the public sector towards the private sector, which represents two-thirds of the economy. But, despite the privatization drive of the government, the state still owns many companies in sectors including banking, energy, transportation, metalworking, and pharmaceuticals. With the notable exceptions of the Suez Canal Authority and the Egyptian General Petroleum Corporation (EGPC), most state-owned companies are not profitable. Following Mubarak’s removal, the privatization process will probably be halted for a time, as the new government has been investigating corrupt practices in previous privatization deals. With the nearly total absence of foreign investors during the past year, it is even less likely that the privatization process will restart anytime soon. 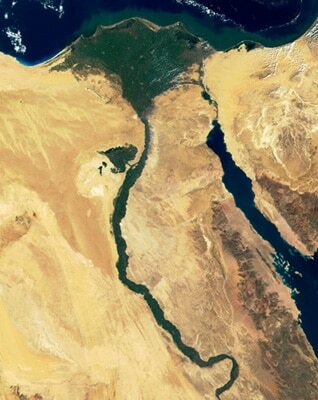 Revenues from the Suez Canal represent approximately 3 percent of GDP. The canal is operated by the Suez Canal Authority, a state-owned enterprise, and is a major financial resource for the government. Revenue has increased continuously over the years as a result of increases in fees and the number of vessels. Revenue increased from USD 1.8 billion in 1997 to USD 4.6 billion in 2007. The waterway earned a record USD 5.4 billion in 2008, up another 16.7 percent from 2007, but the international economic crisis reduced traffic through the canal during the first months of 2009. Egyptian officials say that the Suez Canal and remittances by Egyptians working abroad were the only two sectors not negatively influenced by recent political developments in Egypt. Since 2000, industry, oil refining, and mining produce nearly 20 percent of Egypt’s GDP, growing annually at about 10 percent. While industrial production has declined in the public sector, manufacturing in the private sector has increased sharply, thanks to liberalization and privatization. Most private industries are small to medium-sized, employing fifteen or fewer people. Textiles, garments, and leather production make up 22 percent of manufacturing. Food products, beverages, and tobacco account for 20 percent. Metal products, machinery, and transportation equipment generate another 20 percent, while basic chemicals represent 11 percent of total industrial production. Since 2006, workers in the state-owned textile factories have risen in protest and staged strikes over pay and the prospect of privatization. The salaries of factory workers in Egypt are among the lowest in the world, so it is not surprising that workers in the city of al-Mahalla al-Kubra, where the textile factories are concentrated, were among the first to join the protests against the Mubarak regime. On the other hand, the ready-made garment industry is booming, as 90 percent of the enterprises are owned by the private sector. A particularly successful business is the production of fertilizer, because it was largely privatized after 1998. Exports have increased more than threefold since 2000. Banking, insurance, and brokerage generates slightly over 8 percent of GDP. 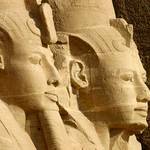 The Egyptian banking system has suffered from political interference and bad management. Overstaffing, a stifling bureaucracy, and repeated loans to unhealthy public enterprises, as well as politically connected individuals are all part of the problem. Non-performing loans were estimated at 22 percent of GDP in 2005. In response, the government launched a Financial Sector Reform Programme in 2004. Part of this effort is to sell the state-owned banks, but privatization has been slow and politically controversial. 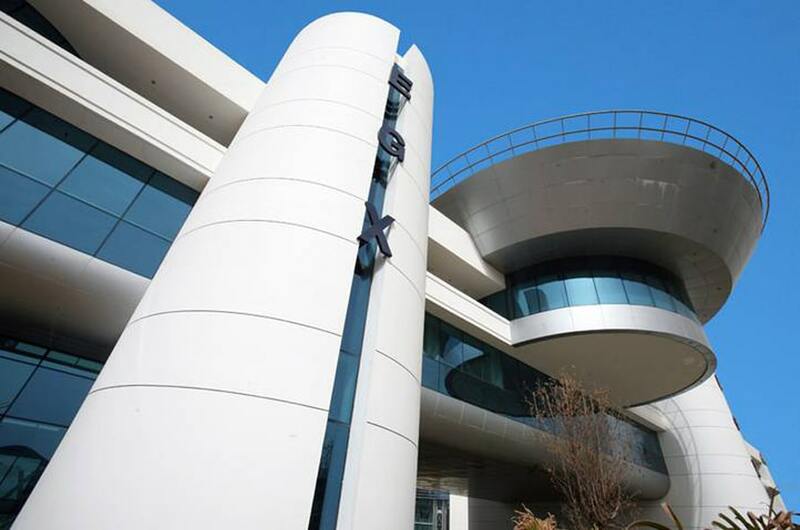 At the end of 2006, 80 percent of the shares of Bank of Alexandria were sold to an Italian investor. There are no restrictions on foreign ownership of Egyptian banks. Slightly more than one hundred stocks are actively traded on the Cairo and Alexandria Stock Exchange (CASE). Investors mostly watch the national CASE 30 index, the EFG Hermes index (which tracks the largest caps on the national exchange and is compiled by the Egyptian investment bank of the same name), and the broader CIBC index (which is compiled by the Commercial International Brokerage Company of Egypt). The CASE markets were dealt a heavy blow after the fall of President Mubarak, losing nearly USD 31 billion, or 42 percent of their value, over nine months, according to officials. Agricultural activities accounted for just over 15 percent of GDP in 2007, down from 17 percent in 2000. Although its share in the national economy is diminishing, agriculture is still the country’s largest employer, with 31 percent of the total labour force, and thus plays a crucial in for the livelihood of the poor. Some 95 percent of agricultural production is destined for domestic consumption. The remainder goes to exports, generating 20 percent of total foreign-exchange earnings. Cotton used to be the mainstay of Egyptian agricultural exports, but the production and export of cotton have declined. Cotton, wheat, rice, maize, and barsim (clover) still occupy 80 percent of the cultivated land. Egypt will remain a net importer of major foods. The country imports half of its wheat and maize needs. The government has plans to reclaim 150,000 feddan (63,000 hectares – one feddan is 4,200 square metres) of land annually, for a total of 3.3 million feddan (1.38 million hectares) of so-called New Lands by the year 2017. Most significant of these reclamation efforts is the South Valley Development Project (Toshka and East Uweinat), west of Lake Nasser, in the far south of the country. Despite reclamation, the total area under cultivation has changed little over the past decades. Gains are offset by the loss of old agricultural land to urban and industrial expansion. On the traditional farmlands an estimated 3.5 million farmers cultivate relatively small fields averaging two feddan (0.8 hectares), a legacy of Nasser’s land redistribution. Production is intensive, yields are high, and fertilizer use is among the highest in the world; drainage and soil salinity are becoming serious problems. Construction has been booming in recent years, due partly to renewed interest in real estate from investors from the oil-rich Gulf countries. Construction represents 4.6 percent of GDP and provides jobs to 9 percent of the labour force. The prices of construction materials, most of which are produced locally, have risen sharply. Critics point out that much of the construction that took place in the later Mubarak years was intended to serve the rich and disregarded the poor. Entire ‘satellite cities’ were built on the outskirts of Cairo, many including closed compounds consisting of palaces and expensive villas built by Egypt’s new business class and corrupt government officials. The government has abolished the tax exemption for owners of unfinished buildings, which was the main cause of entire residential areas full of houses without roofs. 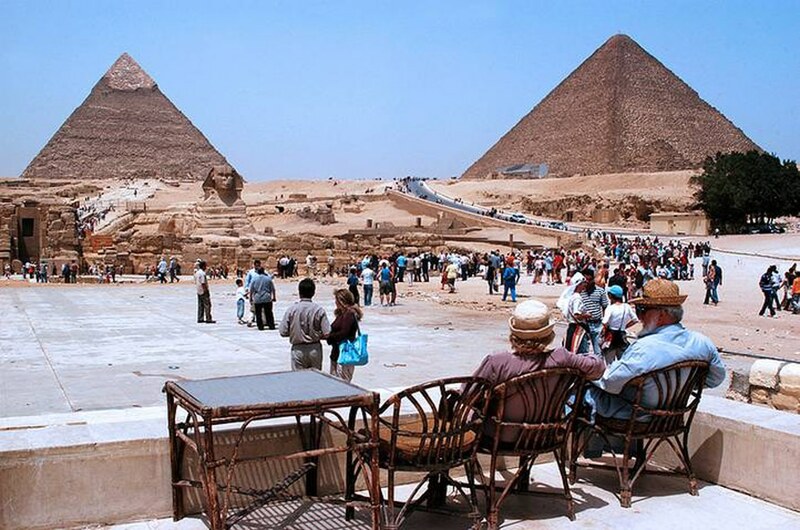 Tourism is a major source of income for Egypt, accounting for almost 20 percent of annual foreign-currency revenue, USD 8 billion in 2007, compared to USD 2.3 billion in 1995. More than eleven million tourists visited Egypt in 2007, and the government was hoping to attract 14 million tourists by 2011, and the total number of nights tourists spend in Egypt was expected to increase from 85.5 million to 140 million, but this entire plan collapsed after recent political developments in Egypt that ended with President Mubarak’s fall in a public revolt. On-going demonstrations and protests by activists demanding genuine reforms, the lack of a stable, elected government, and the outbreak of sectarian clashes were all factors that discouraged tourists from visiting Egypt, and the situation is likely to remain unchanged for some time. Egypt now enjoys a developed infrastructure for tourism, and the government hopes it will be able to restore the industry as soon as reasonable levels of political stability and security have been achieved. Tourism is an important provider of employment, as hotels and restaurants are typically labour intensive. It is estimated that tourism directly and indirectly generates work for more than two million people in Egypt, nearly 10 percent of the labour force. The source of tourists has shifted from Western Europe towards Eastern Europe. Tourists from Western Europe made up half of the total visitors a decade ago, but this percentage has dwindled to 20 percent. The number of travellers from Eastern Europe, particularly Russia, has grown quickly, to almost a quarter of the total number of tourists. About one-fifth of visitors come from the Middle East. Americans account for roughly 3.5 percent of the tourists. 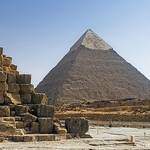 Western Europeans and Arabs still spend the most money in Egypt, 37 percent and 33 percent of total tourist expenditures, respectively, in 2006. Eastern Europeans accounted for only 7 percent of the tourist expenditure in that year. Tourism is very sensitive to swings in the regional and international economies and local and regional security. The 1997 terrorist attack on tourists in Luxor had a devastating effect on arrivals the next year, as did the attacks on the United States on 11 September 2001, the outbreak of the Iraq War in 2003, and the terrorist attacks on several Sinai resorts along the Red Sea in 2004, 2005, and 2006. The revolution and the ensuing events of 2011 have brought the local tourist industry almost to a halt. The explosion and crash of a Russian airplane on the Sinai peninsula in a terrorist attack on 31 October 2015 also is likely to have a lasting impact on the local tourist industry. Following the incident, Russia and the United Kingdom suspended flights to Sharm el-Sheikh Airport and Vladimir Putin banned the national Egyptian airline to land in Moscow. Analysts say that this will result in a decrease of 60 percent in the income from the tourist industry. 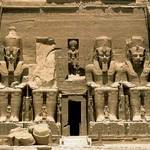 Already in 2014 Egypt registered four million less tourists than in 2010. 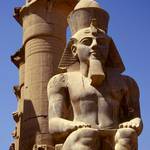 It is likely that the Egyptian tourist economy will face more years of crisis yet. The exploration and production of energy produced 16 percent of GDP in 2011, up from 8 percent in 2001. Proven crude-oil and natural-gas reserves are estimated at about 3.7 billion barrels and 1,850 billion cubic metres, respectively. 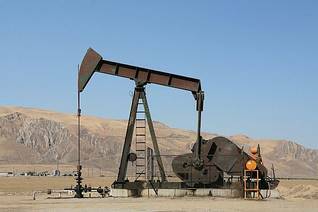 Crude-oil production averages about 760,000 barrels per day, and crude-oil exports account for 52 percent of foreign-exchange earnings from commodity exports. High oil prices are a mixed blessing for Egypt. 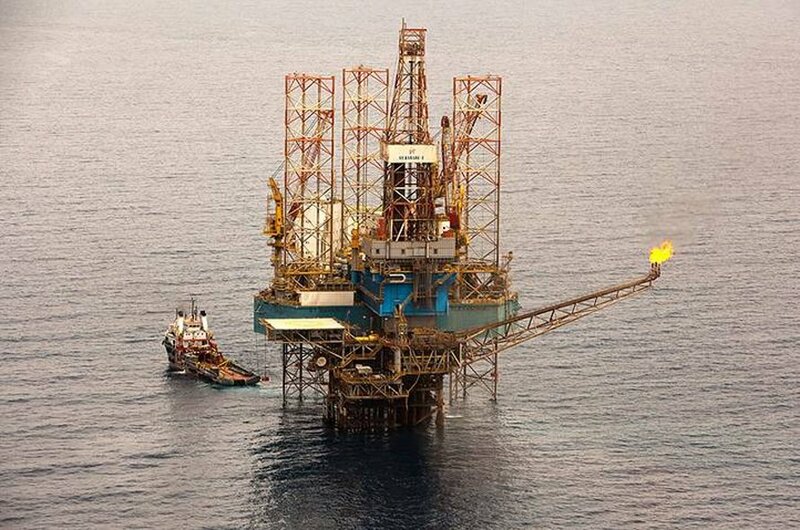 Earnings increase due to the export of oil and gas, but Egypt also sees a rise in costs, because the country is a net importer of refined products (in terms of volume). In 2006, petroleum exports amounted to USD 10.2 billion (93 percent higher than a year earlier), while imports totalled USD 5.4 billion (up 35 percent from 2005). 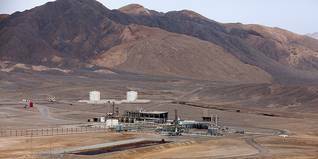 Egypt is rapidly expanding its natural-gas production and exports. In 2003, it exported its first natural gas to Jordan, through the undersea Arab Natural Gas Pipeline across the Gulf of Aqaba. Gas was also sold to Israel, a deal that was highly controversial for political reasons and because of the unfavourable terms for Egypt; since the fall of Mubarak the pipeline has been sabotaged several times. The pipeline was designed eventually to transport gas as far as the European Union. Egypt started exporting liquefied natural gas (LNG) in 2005. The lucrative extraction of minerals includes phosphates, manganese, limestone, gypsum, talc, asbestos, lead, zinc, tin, lead, copper, potash, sulphur, uranium, iron ore, tantalite, and gold. Almost the entire population of Egypt has access to electricity. Electricity consumption is around 1.9 percent of GDP. Demand is forecast to grow annually by 7 percent, to 162,552 gigawatt-hours in 2012. 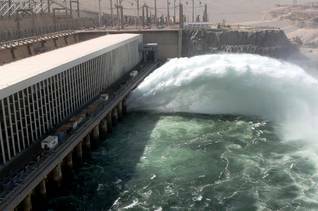 Most electricity is generated from locally produced gas and hydropower, the latter mainly from the Aswan High Dam. In order to meet the rising demand, another 13,009 MW is scheduled to be in service by 2012, at a cost of USD 2.5 billion. The increased supply will be generated from natural gas, liquid fuels, hydro, solar power, and wind power. President Mubarak had announced plans to build four nuclear power plants. 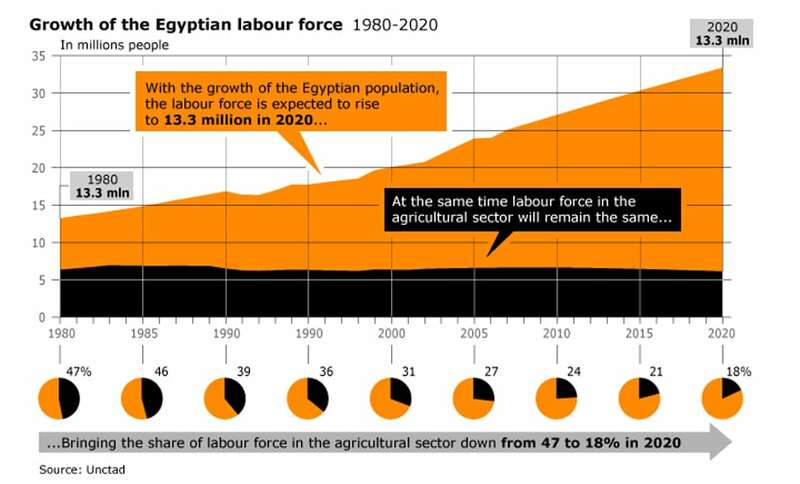 Since 2006, Egypt has witnessed a wave of labour unrest not seen since the 1970s. The strikes that started at cotton-textile factories inspired workers in all sorts of industries, as well as civil servants. Unhappy with their meagre compensation, poor working conditions, and rising prices, the workers found that the official trade unions, which are strongly connected with the regime, do not serve their interests. More often than not, the government had to agree to at least some of the demands, leading more workers to strike. 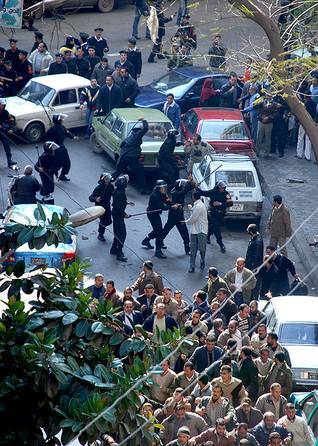 On 6 April 2008, mass labour protests in al-Mahalla al-Kubra erupted into riots and clashes with security forces, leaving three dead, many wounded, and dozens arrested. A youth movement, named 6 April Youth Movement, emerged after that day of strikes and protests in al-Mahalla al-Kubra and spearheaded the groups that organized the protests of January and February 2011.